Xuron's solution for easy, safe and damage free removal of photo-etched parts. As photo-etched parts become smaller and more detailed it is important to have the proper tool for removing them from the fret. The 9180ET's long, thin, ultra sharp tip easily cuts delicate PE without bending, pinching or twisting. 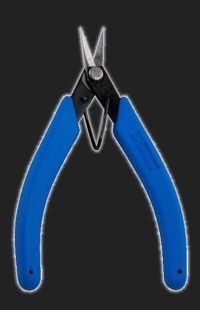 Ergonomically shaped handles offer superb control and stability as well as comfort. Return spring brings tool back to open position after each cut.